Tramadol (Ultram) is a pain relief medicine which acts on the brain to achieve its effects. Instead of working directly on the area of pain and inflammation like Rimadyl and other NSAIDs do, it changes how pain is felt by binding to mu-opioid receptors and inhibiting the reuptake of chemicals known as serotonin and norepinephrine in the brain. 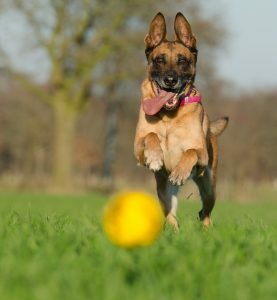 It can be given to dogs who’ve had surgery to reduce pain and is also sometimes prescribed by vets for treating dogs with moderate, or moderately severe pain, both short-term and long-term. For the ongoing management of degenerative conditions (e.g. osteoarthritis) other medicines are often needed in conjunction – commonly NSAIDs, gabapentin, or amantadine. To treat your dog’s arthritis without exposing him to the risks of tramadol we recommend Flexpet, a safe and clinically-proven remedy for joint pain in dogs. The special blend of ingredients in Flexpet work together to stop joint pain in just 7 days! Note: Tramadol is a prescription medicine which can have serious consequences when misused. Never give it to your dog without approval and guidance from your vet. The recommended dosage for dogs is 0.5 mg/lb to 4.5 mg/lb to be taken by mouth every 8 to 12 hours, but this can vary depending on the condition being treated. For example, pain associated with cancer may warrant a dose on the higher end of the scale, while milder pain may only require around 1 mg/lb for relief. The dosage may also be adjusted by your vet depending on how your dog reacts to the medicine. Giving the medicine with food can help to prevent vomiting – hiding it in food can help to mask the bitter taste. Pain relief effects may not be noticeable immediately, it can take up to 2 weeks to see a difference in chronic conditions such as degenerative joint disease (DJD) and cancer. Best results are seen when the drug is given with NSAIDs such as firocoxib or other medicines such as gabapentin or amantadine (depending on the condition being treated). Extended-release capsules are not given to animals, but if for some reason they are used, it is important that the capsules are swallowed whole. If they are broken or chewed, symptoms of overdose could occur. Sometimes the vet may choose to inject the medicine, which can be given either intravenously (into the bloodstream) or subcutaneously (under the skin). Studies have shown that both methods of injection are equally effective but an IV injection begins working faster. Will my dog develop a tolerance to tramadol? 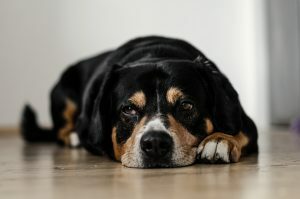 Dogs can develop a tolerance to the effects of tramadol over time, so if you are planning to use it for sustained periods the regular dosage may become ineffective. When this happens, the vet may choose to prescribe additional medication (such as NSAIDs) to be used in conjunction. Generally, it is recommended that this medicine is used for shorter-term pain management – for example, following surgery. Some tramadol products, especially those created for humans, contain additional active ingredients. It’s best to use plain tramadol for treating dogs, as some of the most common added ingredients (for example acetaminophen in Ultracet) can be dangerous when given at inappropriate doses. For example – Acetaminophen is dosed at between 4.5 – 6.5 mg/lb in dogs. 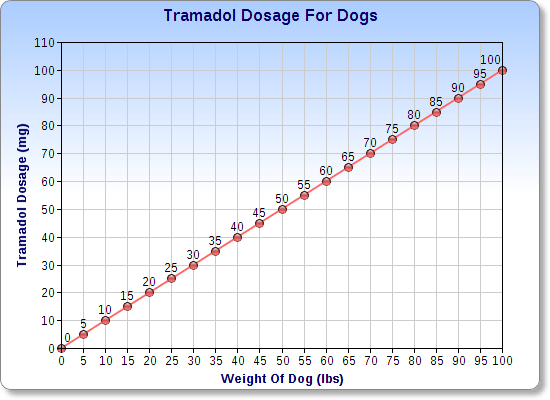 Ultracet contains tramadol at 37.5 mg and acetaminophen at 325 mg (a dose which would be above the recommended range for any dog under 50 lbs). How can I withdraw the medicine? Though physical dependency is less common than with other opioids, if treatment is discontinued after long periods of use the dog should be weaned off gradually. Example: Using a dosage of 1 mg/lb, a 50 pound dog may be given 50 mg every 12 hours. In other words one 50 mg pill twice daily. Though the medicine can cause serious side effects when misused, when used correctly it is often well tolerated by dogs, with sedation being the most common adverse effect. However, it may be unsuitable for use in dogs with existing liver disease and kidney disease (in which case the dosage may be adjusted) as these organs are responsible for metabolizing the drug. Dogs with poor lung function, seizure disorders, or a sensitivity to other opioids may also be unsuitable. It should not be given to dogs who are being given MAOIs (this includes Preventic tick collars) or SSRIs. Dogs taking medicines which lower the seizure threshold, or which depress the central nervous system and respiratory system are at a higher risk of side effects. It may also be unsuitable for severely debilitated or elderly dogs. Pregnancy & Nursing: Tramadol passes in milk in low amounts and has been shown to be embryotoxic and fetotoxic at high doses. It is not suitable for pregnant or nursing dogs. You need a prescription and treatment plan from your vet before giving this medicine to your dog. When speaking to the vet you should tell them about any medical conditions your pet suffers from as well as any medicines or supplements you are giving him. In particular, SSRIs and MAOIs are to be avoided during treatment, and the use of digoxin with tramadol has been linked with toxicity. What should I do if my pet reacts badly? Using tramadol only when told to do so by a vet helps to reduce the chance of any serious reactions, though it’s important to be able to spot the signs of a bad reaction and act quickly. If your pet develops problems such as breathing difficulties or an abnormal heartbeat you should get in contact with the vet immediately. Overdose cases can be especially dangerous. You can read about overdose symptoms here. It is rarely used for anxiety as there are safer alternatives like Zylkene and Benadryl for this purpose – plus, tramadol has been known to cause anxiety in some cases. * May indicate an allergic reaction, especially when multiple marked symptoms are present. Most side effects are a result of tramadol’s action on the central nervous system, whereas others, for example constipation, are rarer and most often seen when the drug is used long-term. If your pet suffers any serious reactions to the drug such as breathing difficulties or allergy symptoms you should contact a vet right away. Look out for hives, rashes, itching and a racing heart rate which are all signs of an allergy. If you suspect your dog has been given (or has accidentally ingested) an overdose seek emergency veterinary care. Note: Naloxene should not be given following an overdose, as it can lead to seizures. If seizures do occur benzodiazepines such as Valium (diazepam) or barbiturates may be used to control them. For reversing stimulation, cyproheptadine may be given. Do not administer any medication yourself, your dog must be treated by a medical professional. Cyproheptadine and phenothiazines are both options to treat stimulatory symptoms.